Defenestrate the format! Down with long-form podcasting! OK, not really. I actually like our format quite a bit. Unfortunately, things in the Children of the Force household have been rather busy lately (all good things, thankfully), and we just haven’t had the time to sit down for a proper recording. But that doesn’t mean we don’t do a podcast. This endeavor of recording and publishing a podcast has quickly become something that makes me really happy. I feel complete when we put something out there into the world. Whether or not it’s enjoyed by a few people or a few hundred people (we’re somewhere in the middle there … quite a bit closer to the former), it’s worth it because the kids and I get so much enjoyment out of the whole process. Anyway, enough of my banthering. Let’s talk about the episode, which you can listen to on iTunes, Stitcher or Podbean. This is where the trading begins. First, the kids have fallen in love with Topps Star Wars Rebels trading cards. In this episode, you’ll actually hear Anna open her first pack. Liam already opened a couple packs before this point and is chomping at the bit for more. They’ve already done the trade you hear about on the show, plus a couple more. Unfortunately, Anna and Liam don’t know anyone else who collects these cards! Anyone want to make trades via snail mail? Email forcechildren@gmail.com and we’d be happy to line something up. In fact, it would be really cool to get a Star Wars pen-pals thing going on. Look for another post about this in the near future. Let’s make it happen, people. The second segment of this show is me doing a poor job of pretending I’m David W. Collins and comparing “Across the Stars” from Attack of the Clones to “Flight to Neverland” from Hook. I pull parts out of both of those songs in the episode, but just in case you wanted to listen to the complete versions, here they are. If you’re reading this, you’re probably familiar with “Across the Stars.” To hear the part from “Flight to Neverland” that really reminds me of it, just go 53 seconds into that video and you’ll hear it … probably. But seriously, if you’re not listening to Star Wars Oxygen with David W. Collins and Jimmy Mac, you’re missing out on some fantastic analysis of the music of Star Wars. Click on these words to take your first step into a larger musical world. 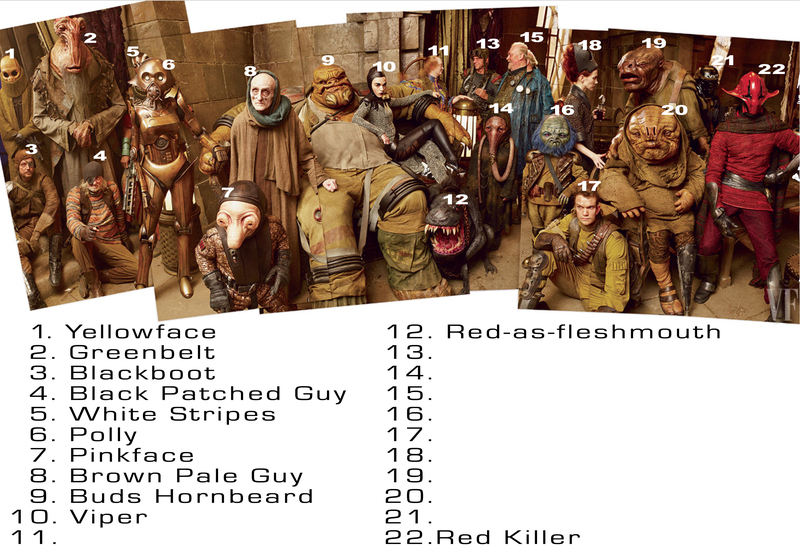 Bonus: Here’s an incomplete visual guide to the names we gave Maz Kanata’s Castle-dwellers in our Star Wars Day Spectacular. One of these guesses has to be right. Right? I think the kids and I are going to try to finish naming these castle dwellers in the next episode. Any suggestions? I can’t decide whether 19 and 20 are going to be the easiest or hardest to name. Yes! I’m going to run these by the kids in an upcoming episode. I’m sure that they’ll approve.